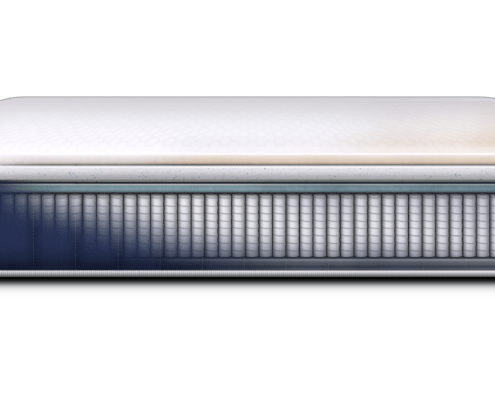 Brooklyn Bedding Aurora Mattress Review l Unbiased Review - Is it Worth it? The Aurora is Brooklyn Bedding’s NEW Hybrid Mattress. 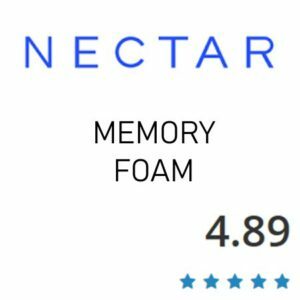 With their own factory and direct to consumer pricing, this is worth a hard look. It also comes in firm, medium or soft and is designed to sleep very cool while providing great pressure relief while still having good bounce. Read more about our Brooklyn Bedding Aurora Mattress Review below. Brooklyn Beddings hero technology, TitanCool, consists of a phase change surface infusion and high conductivity properties that draw excess heat away from the body, maintaining ideal temperatures for each sleeper. Added comfort is achieved through TitanFlex, a patented, hyper-elastic foam with immediate response technology that adjusts to every motion. TitaniumGel infusion helps promote an anti-bacterial sleeping environment with greater stability. The Brooklyn Aurora is also engineered with up to 1,283 individually pocketed coils, allowing for better motion transfer and reactivity while minimizing sleep disturbance. Custom made in the USA using the highest quality materials, our personal approach to designing, stitching and crafting your bed is backed by a 10-year, no hassle warranty. 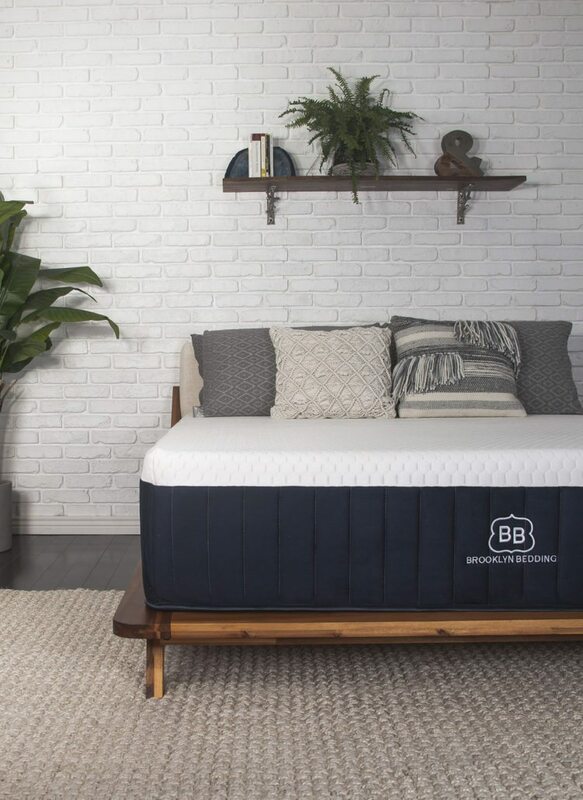 Want a triple choice on firmness – Brooklyn Bedding knows one feel is not perfect for everyone so they offer this mattress in firm, medium and soft. Like to sleep cool – The Titan Flex or Latex foam will not get excessively hot at all. Kayla is typically always cold so heat was not an issue for her either. The advanced technology of TitanCool produces an optimal cooling effect as you sleep – its water-based surface and high conductivity properties draw excess heat away from the body, maintaining ideal comfort for each individual sleeper. A proprietary and luxurious smooth top weave, exclusive to premium bedding, provides cooling on contact. Are looking for a mattress to fit all sleeping positions – Aurora is offered in 3 firmness’s so you are able to pick the firmness that fits your sleeping style. Comfort is achieved through TitanFlex, a patented, hyper-elastic foam with immediate response technology that adjusts to your body each time you move. Infusions of copper and TitaniumGel help promote an anti-bacterial sleeping environment with greater stability. 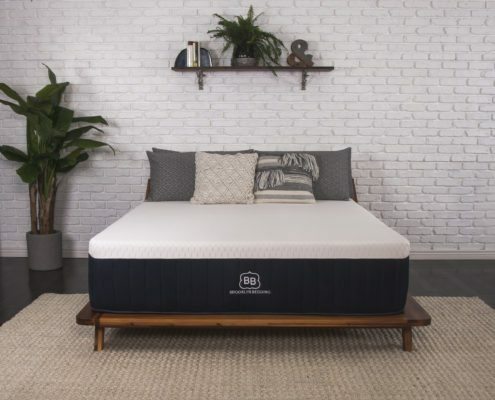 Prefer an all foam feel- Although the Aurora by Brooklyn Bedding has good motion reduction and body conformance it is a hybrid so if you are more of an all foam lover with the best motion reduction you may not like the hybrid design. 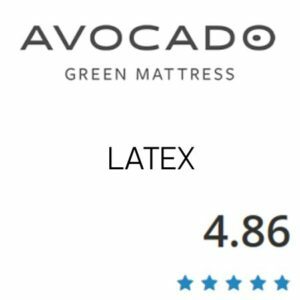 Have a tight budget – This is a luxury mattress and the price tag shows it. SO if you are looking to spend under $1000 for a Queen you will want to look somewhere else. Although you can finance. The reason I bought a Brooklyn Aurora was because my $3,000 Tempurpedic was so hot and softer after a few hours that wake me up every-night. With Aurora you can feel a comfortable chilling effect. One tip: I ordered together with a Mattress Protector. I removed it after the first night because, this retain heat. This is a quality bed and there are many things I like about it. I got the medium in a Queen. It’s easy to get in and out of, great edge support. It’s comfortable and supportive for every part of me except my low back. I’m mostly a side sleeper. For people who have purchased a bed from you in the past, you need to communicate that the aurora will feel much plusher than the signature at the same firmness level. The first thing you will do when you get your Aurora mattress is bring it to the room you will open it in. You do not want to unroll it in another room. Once you are ready to open it you can use the cutter some brands provide, if not use a scissors and be careful not to cut the fabric. As it starts opening it will expand quickly and you will only notice a slight “new mattress smell”. The Aurora mattress is made in the USA so it is not roll packed very long, which helps with minimize off gassing. The Brooklyn Bedding Mattress will work great on any solid surface. 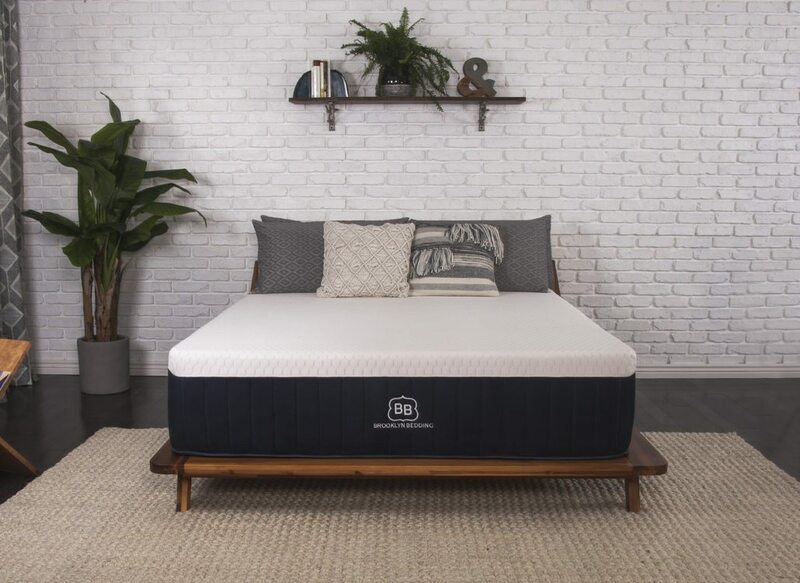 Whether you pop in on the floor, on a wood foundation/boxspring, a platform with slats or upgrade to an adjustable base, this mattress will perform great. The Brooklyn Bedding Mattress did not trap heat for us. I am a firm believer that eventually your mattress will end up the temp of you body but some foam disperse heat better than others. Latex in my opinion is best for temperature regulation and their new foam performs in a similar way. You should not have any issues getting overly hot on this mattress. We tested on twin xl’s and don’t have the adjustable for a king. However, the Brookly Mattress will have no issues on an adjustable. It will work great. 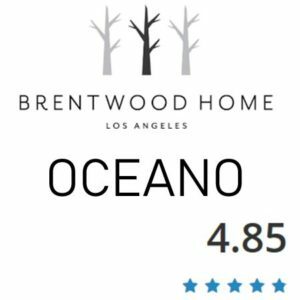 A family-owned company founded in 1995 by two brothers aiming to sell great mattress products for less. They started off selling mattresses in a small store and everything progressed from there. Now they own their own factory and employ over 100 people. 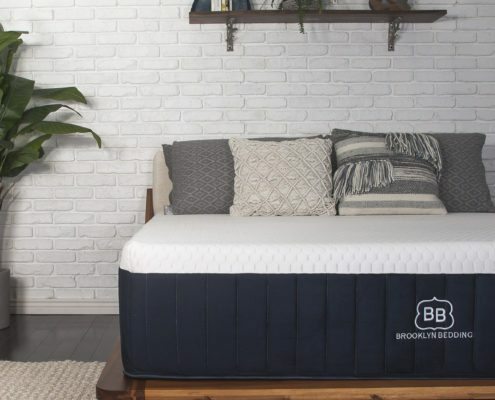 In 2015 Brooklyn Bedding purchased a new 145,000 square foot facility and redesigned their online business model to revolve around one mattress. There were a few companies with the “one-mattress-fits-all” idea already, but BB took it to the next level. To build a mattress that works for everyone, not just the average person. #BestMattressEver was born and designed with three comfort level options; Soft, Medium, Firm – A mattress designed for everyone. BB didn’t stop there, their new mattress needed friends; #BestPillowEver & #BestSheetsEver. Together, they form the TRIO of bedding products that Brooklyn Bedding strongly believes will help you sleep better and without breaking the bank. Now they have launched the Aurora Hybrid to hit the hybrid market with a luxury mattress. Brooklyn Bedding owns their own factory. I really like that aspect.